Community members filling up at a community water tap. Water users pay a fixed tariff per jerrycan of water collected. 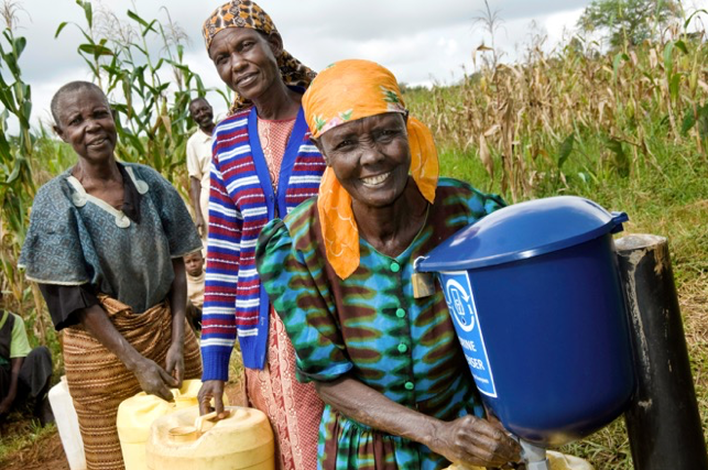 Water For People advocate to ensure that tariffs charged are, on the one hand, affordable to community members and, on the other, sufficient to cover operation and maintenance costs. Photograph courtesy of Water For People. Through their impact model known as Everyone Forever, Water For People aim to reach Everyone in a district; providing reliable water and sanitation services for every family, clinic, and school. To ensure water and sanitation services are sustainable, Water For People builds capacity in communities, service providers and governments to invest in appropriate long-term water and sanitation solutions. According to the Joint Monitoring Programme, only 57% of Rwandans have a basic level of service for drinking water, while an estimated 62% have basic sanitation services, demonstrating a genuine need to invest in water and sanitation. Water For People has been working in Rwanda since 2008 and currently implements the Everyone Forever model in three Rwandan districts. Building the capacity of the national government, district governments and private operators to sustain and manage water systems. Training entrepreneurs and small businesses to offer scalable, market-based sanitation solutions. ​According to WaterAid only 25% of health clinics in Malawi have access to clean water, 8% have no toilets at all and 54% do not have waste receptacles. As a result, clinics are not hygienic and midwives are unable to wash their hands between deliveries, increasing the risk of bacterial infections, often fatal for mothers and newborns. This project focusses on delivering water, sanitation and hygiene (WASH) interventions to health clinics and communities in the Nkhotakota, Kasungu and Machinga districts of Malawi. Through this project over 650,000 people in rural Zomba will be able to treat water with chlorine thereby preventing diarrheal diseases. Photograph courtesy of Evidence Action. Evidence Action take evidence-backed cost-effective development interventions to scale, working to turn successful trials into sustainable large-scale organisations. We were asked to contribute to one of their main programmes: Dispensers for Safe Water. Diarrhoeal diseases are among the leading causes of under-5 mortality. Safe drinking water is widely accepted as a key intervention in the prevention of diarrhoea. Dispensers for Safe Water treat water with chlorine: a proven, low- cost water treatment solution. The programme consists of three components: (1) installation of chlorine dispensers directly at local water sources; (2) working with local community promoters who market, maintain, and refill the dispensers; and (3) overseeing a locally-staffed delivery and repair supply chain. The Malawi programme started as a small pilot in the Zomba District in 2013 and now serves 652,073 people through 3,772 confirmed chlorine dispensers, covering 99% of the Zomba District. Evidence Action have achieved and maintained a remarkably high chlorine adoption rate of over 80% among its Malawian beneficiaries. The Charity’s grant will be used for: (i) continued chlorine procurement and delivery, (ii) dispenser maintenance and repair, (iii) training/retraining promoters and government Health Surveillance Agents (who conduct community education, chlorine stock control and provide feedback to Evidence Action in the event of dispenser breakdowns/damage), (iv) mobilisation of the community to maintain the high adoption rate and (v) generation of carbon finance. Reduce the percentage of under-5 children reported to have had diarrhoea in the previous two weeks from the pre-programme baseline of 13.6% to 3%. Increase the percentage of households with chlorine residual in household drinking water during unannounced visits from the pre-programme baseline of 1% to 80%.